Thomas Evans was born on 9 Mar 1776 in Chapel Ash, Wolverhampton. His father was John Evans the inn keeper of the Old Bell Inn on the western fringe of the rapidly growing town of Wolverhampton. He was baptized on 20 Apr 1776 at St Peter’s Collegiate Church in Wolverhampton. His father died in 1784 and he was brought up by his mother Mary. She herself was to die in 1792 but the young Thomas was clearly a determined and resourceful boy. He must have left and joined the army shortly after this, leaving his elder brother Richard to manage the Inn business. His distinguished military career is best recorded on the Canadian National Biography website, despite some factual errors about his childhood family. 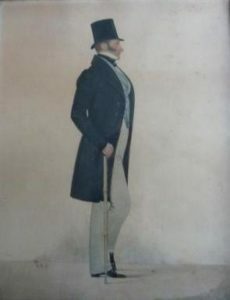 It should also be noted that contrary to the Canadian National Biography he is NOT the uncle to Francis Evans, Irish born clergyman in Upper Canada – that is Lieutenant Colonel William Evans (see Tecumseh’s Last Stand, John Sugden 1990) and the will of Francis’ father, Francis Evans, Nantes 1836. Having served with distinction in repelling the Americans from Canadian soil in the war of 1812, Thomas Evans’ young family grew up in Trois Rivieres in Montreal. In about 1827 Thomas Evans, promoted to Lieutenant Colonel, was posted to Ireland based at Templemore Barracks, Tipperary and a number of his children were bought up and saw Ireland as their home. This is the basis of the Evans family in Ireland and the Egerton Warburton branch that came to settle in Monkstown, Cork and held various clerical posts in and around the Cork area. We have a portrait by the well known artist Richard Dighton, labelled “Thomas Evans, Governor of Malta” that may have come from the artifacts we have inherited from his son Charles Richard Ogden Evans. Other family documents record him also as “Governor of Gibraltar”. In reality he was never the titular governor of either of the colonies, although he was the commanding military officer. At least as far as Malta was concerned he was formally Acting Lieutenant Governor from July to October 1836 that meant he was the acting head of government during the illness of Major General Sir Frederick Cavendish Ponsonby. He arrived in Malta from Gibraltar on 1 July 1836 with 489 men and immediately took command. (see Malta Government Gazette). A successor to Ponsonby was appointed on 1 October 1836. He left Malta and retired to Canada after 1838, where he died in 1863. 1 Dictionary of Canadian Biography.